Eucalyptus oil has a clear, sharp and fresh smell. It is very useful in treating flu, headaches, cold and respiratory problems. When blended with a massage oil it can assist with sinusitis, fatigue, muscular aches and pains. 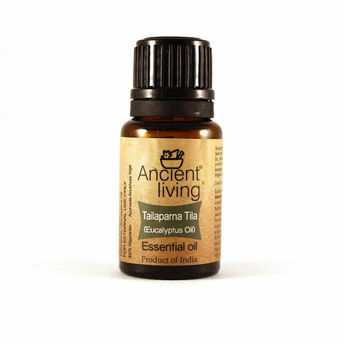 Use energizing Ancient Living Eucalyptus essential oil if you are feeling tired, run down or are prone to colds. It is best known for its fighting power against chesty coughs and colds and it has probably been used to rub many a chest over the years! It helps to clear the mind and focus concentration. It feels cool to the skin and yet warms the muscles. Decongestant, antiseptic, expectorant, analgesic, stimulant, antiviral, bactericide, febrifuge, rubefacient, muscle relaxer. Effective against bacteria - especially staphylococci, and has a refreshing and stimulating action on the mind. Soothes inflammation and eases mucus, clearing the head from the stuffiness of colds. Protects against flu and infectious illnesses. Eucalyptus oil uses have long been known to include anything regarding the respiratory system, including during asthma attacks, bronchitis infections, colds, and more. Excellent for treating all types of fever. It has a profound cooling effect on the body and so lowers temperatures. Its antiseptic and healing properties is helpful for cuts, wounds and burns - Do not use without a solution (Dilute). Can be used in aromatherapy massage to relieve aching muscles and rheumatic pain.